As we get ready to hit the road for the start of our 15th season, I just wanted to share a few thoughts regarding the experience of going away to hockey camp. I get a ton of inquiries from players wanting us to bring a camp to their hometown, and we are always looking at new locations. But while having a camp at your local rink may sound ideal, for many of us, getting away to camp is a far better experience. Look, having a camp at your local rink is certainly convenient, and is also the most economical way to gain all of the benefits of an intense weekend of learning and training with our knowledgeable and passionate staff. But if you can swing it, getting away offers quite a number of advantages. 1) No Distractions. When you attend camp locally, there are so many potential distractions that can prevent you from gaining the full benefit of the Weekend Warriors experience. For some it’s the job. For others, it’s the family or the dog. The fact is, you haven’t really extracted yourself from everyday life. Now this doesn’t apply to everyone. 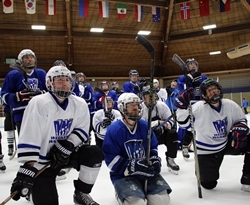 There are those who attend at their home rink, and fully participate in all aspects of the camp. Similarly, there are those that go away to camp, but get distracted by work or family matters. You have to know yourself, and your personal situation. I’m merely suggesting that you think about your situation, and if that extra buffer of going away to camp might be a better option for you. If you do attend camp locally, then consider setting some boundaries with work and family. Maybe even tell the boss that you’re going away to hockey camp. No need to let them know you’re still in town and tempt them any more than necessary. Some local players have even been known to book a hotel room one or 2 nights, rather than commute home every night. 2) Total Immersion. Players who go away to camp are, in general, more immersed in the experience. This includes not just the on ice sessions, but all of the off ice portions of the camp as well, including chalk talks, video reviews and social events. This total immersion yields a more enjoyable and satisfying experience. Again, even if you’re local, try to experience this total immersion to get the most of your camp experience. Think of the camp as an investment in yourself and your game. In order to get the most return on your investment, you’ll want to participate in all aspects of the camp. 3) Camaraderie – “Camaraderie, Shamaraderie…That’s a bunch of BS. I’m just here for the drills.”, you say. Well I could not disagree more. While the learning experience is the most compelling reason to attend hockey camp, do not underestimate the power of the people. And as people, hockey players, particularly Weekend Warriors, are some of the best on this planet. We have a passion for this game, and when we get together to learn, play and talk about this game, there is a special energy that is pretty hard to duplicate. Players come to camp and forge friendships with fellow payers, coaches and yours truly…friendships that will last for many years to come, if not a lifetime. In my opinion, the camaraderie is the “special sauce” that makes the experience so memorable. 4) It’s a Vacation – Make no mistake, you’re not going to be lying on the beach getting a tan (except maybe in Tahoe). You’re going away to play a sport you love, and learn to play it better. It’s hard work. When you get back, your body might not feel like it was on vacation, but your mind and spirit will be recharged after such an exhilarating experience. I would like to address some common reasons people use to not go away to hockey camp. It’s Too Expensive – I’m not going to mislead you. Going away to camp is definitely more expensive than attending at your local rink. But assuming there is no flying involved, it’s not as expensive as you may think. It can be a nice little road trip. Gas is cheap these days, and you don’t need to eat prime rib every night. We even provide dinner on Saturday, and many of our hotels include breakfast. The biggest additional expense is the hotel, and we do our best to negotiate a good deal for our players at each location. But the best way to minimize your hotel expense is to split the cost of a room. So bring a buddy along, and if that’s not an option, then send us an e-mail and ask us to help connect you with a roommate. We’ll do our best to help you out. I Can’t Fly with My Hockey Gear – Many people assume that since the airlines and TSA have made flying less fun than a colonoscopy, that it would be prohibitively expensive to fly with hockey gear. Well, the truth is, it’s not as bad as you may think. Most airlines have policies that treat sports bags with a special set of rules. So even though it’s a bigger bag, you can check it for the cost of a regular bag. And get this, your sticks count as part of the bag. And if you fly Southwest, your bags fly free. Also consider that you don’t need to pack your tux, as our camp social events are totally casual. You can even stick your clothes in your hockey bag or your carry on so you don’t need to check 2 bags. For more details, see our page on Flying with Hockey Gear. We have a lot of fun destinations, so don’t limit yourself to driving distance if there’s a more distant camp that intrigues you. I Don’t Have Anyone To Go With Me – You want to go, but you can’t talk any of your hockey buddies into going with you? That’s pretty common. Don’t be deterred. Weekend Warriors are fun and friendly people, and the atmosphere at our camps is so conducive to making friends. Before we take the ice on Thursday, at our orientation meeting, we all get acquainted as we introduce ourselves to one another. 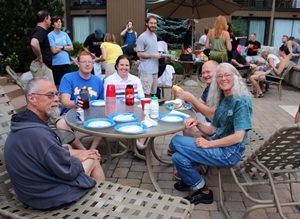 Then immediately after the first ice session, we head out for a beer and a bite to eat in our “Break the Ice” Social. By the time you get to the locker room on Friday morning, your new friends will be waiting to chirp you in the locker room. Going away to hockey camp is not for everyone. For many it’s just a matter of budget. If your budget allows, then I would highly recommend taking your game on the road. It will be a vacation you won’t soon forget. But if getting away is out of reach for financial or other reasons, then of course we want you to attend locally if there is a location within commuting distance of your home. Just remember to avoid distractions and immerse yourself in the camp in order to maximize your learning and enjoyment. Posted in Blog and tagged Hockey Camp, Travel.